Closeup of little boy's hands giving a gift box wrapped with golden ribbon to his mom on Mother's Day. Loving little son making nice surprise for his mother on holidays at home. Close up of elderly male hands giving present to woman during romantic evening at restaurant. 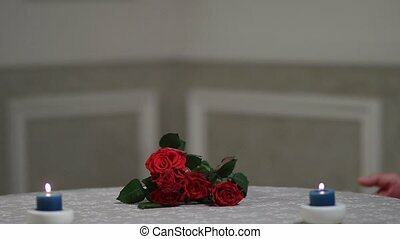 Senior man's hands giving wrapped gift with red ribbon to his wife on Valentine's day over decorated table with bouquet of red roses and candles. Close up, female hands giving a gift to boy. 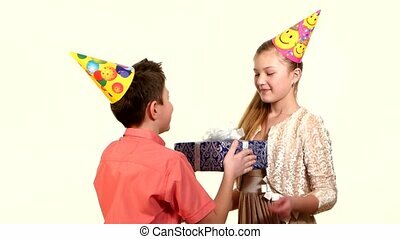 Close up of mature man's hands giving golden gift box with red ribbon to his beloved woman during celebration of Valentine's day. 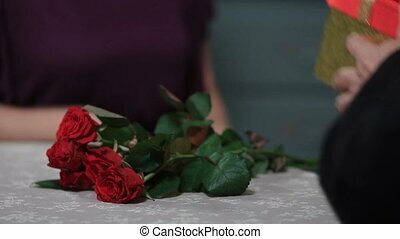 Elderly husband giving present to wife on anniversary at the restaurant over table decorated with bouquet of red roses. Happy mother's day! Loving little son congratulating his charming mother and giving her gift box in domestic room. Cute preschool boy giving present to smiling beautiful mother on Mother's Day. Cheerful preschool boy giving yellow tulips flowers to his happy mother , emabracing her from behind and kissing with love and tenderness on Mother's Day. Little son greeting his smiling mom at home. Excited smiling mother receiving a holiday gift box from her loved son on Mother's Day in domestic room. Overjoyed mom opening a present given by her preschool boy on birthday and clapping hands. 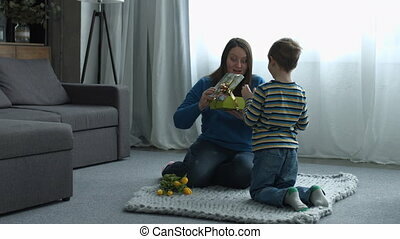 Beautiful middle aged single mother receiving a present from her cute little son on Mother's Day in domestic room. Excited smiling mom opening gift box presented by her preschool boy at home. Happy little boy embracing his beautiful mother in bed after awake. Affectionate preschool boy rushing to hug his beloved mom in the morning while mum with smart phone relaxing in bed at home. Cute little boy holding a gift box for her beautiful mom behind his back preparing nice surprise for his mommy on Mother's Day at home. Surprised single mom receiving present from her beloved son. 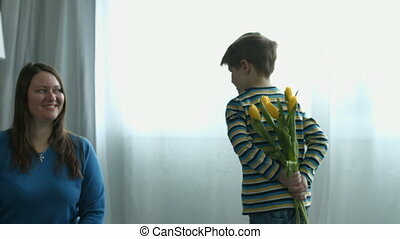 Loving little boy greeting her smiling attractive middle aged mother and giving her yellow tulips flowers on Mother's Day at home. Joyful single mother receiving flowers from her cute son on birthday. Rear view of preschool with bunch of beautiful yellow tulips behind back preparing nice surprise for his cheerful mother on Mother's Day at home. Cute kid giving flowers ot his mom and embracing. Joyful little cute boy performing song to his joyful smiling mother in domestic room while spending Mother's Day together at home. Cheerful preschool boy singing into microphone toy for his happy mom. 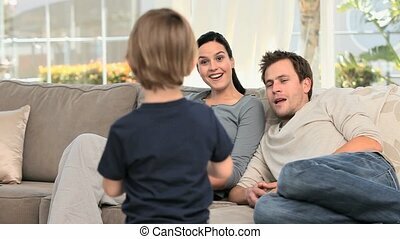 Middle aged attractive single mother sitting on the floor face to face to her cute son playing clapping hands in domestic room. Pretty smiling mom playing patty cake game with preschool boy at home. Closeup male hands giving bouquet of fresh chamomiles to his girlfriend and holding red velvet box containing engagement ring while making marriage proposal to beloved woman outdoors. Joyful father guessing in which hand child hiding christmas present while sitting under christmas tree. Positive carefree daughter hiding gift box behind back, making surprise to her father for xmas. 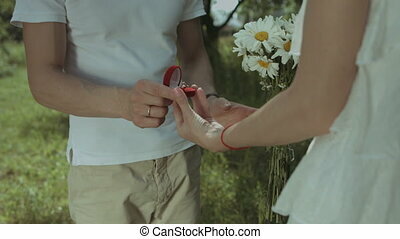 Midsection of young man giving bouquet of fresh chamomiles and engagement ring to his beloved woman in public park. 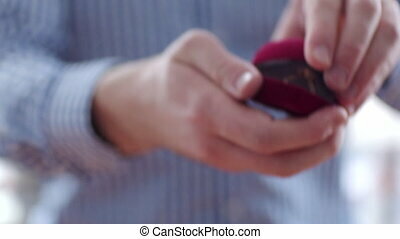 Closeup of male hands holding box with wedding ring during marriage proposal. Handsome affectionate man giving christmas present to his loved girlfriend under the christmas tree in domestic room. Joyful boyfriend surprising his woman with christmas gift during winter holidays. Cheerful handsome man covering eyes of pretty woman and giving a present on Valentine's Day in domestic room. Affectionate boyfriend surprising his charming girlfriend with gift at home. 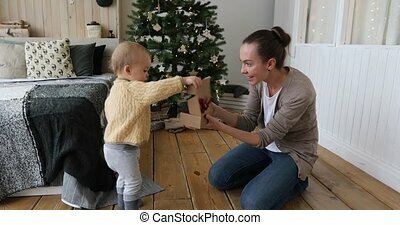 Joyful mother and father giving a big wrapped gift box to surprised cute daughter while sitting under the christmas tree. Excited child receiving xmas present from parents during winter holidays. Cheerful beautiful woman giving present to surprised man in bedroom on Valentine's Day. Amazed man with digital tablet receiving gift on birthday from his beloved excited girlfriend in domestic room. 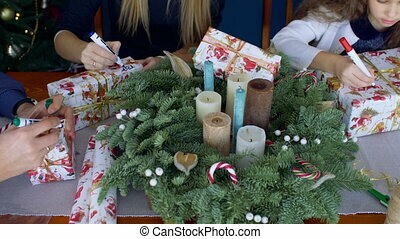 Close-up of human hands signing and writing names on christmas gift boxes while family preparing for winter holidays at home. Parents and little girl signing up christmas presents with marker pens. Closeup of male hand putting engagement ring on woman's hand in public park. 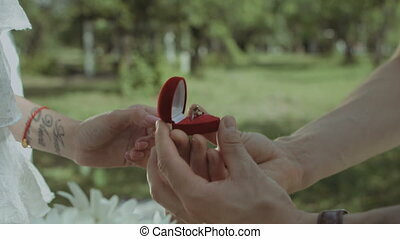 Midesction of young man proposing to his girlfriend and holding box with wedding ring in park.